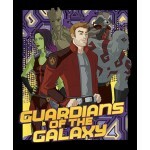 Guardians of the Galaxy fabric for quilting, apparel, craft and decorating projects. Guardians of the Galaxy fabrics are licensed by Marvel Comics. Guardians of the Galaxy Gang Circles fabric features Groot, Rocket Raccoon, and the group of Star-Lo..
Guardians of the Galaxy Group fabric features a group drawing of Star-Lord, Rocket Raccoon, Groot, G..
Guardians of the Galaxy Movie cotton fabric panel features characters from the Guardians of the Gala..
Guardians of the Galaxy Panel features a group drawing of Star-Lord, Rocket Raccoon, Groot, Gamora a..
Guardians of the Galaxy War fabric features Groot with Rocket Raccoon, and the group of Star-Lord, G..